Purple Haze is a technical solutions and equipment provider based in Woerden, The Netherlands, and the company is run by the charismatic Andre van der Heyden and was founded by him 35 years ago. It was named after the legendary song written and recorded by one of his heroes, Jimi Hendrix. Andre bought his first Robe products in 2004 and has been a loyal and keen supporter of the brand ever since, continuing to invest regularly in Robe over the years. His most recent purchase - from Robe’s Benelux distributor Controllux - has been 16 Pointes and eight MMX Spots. 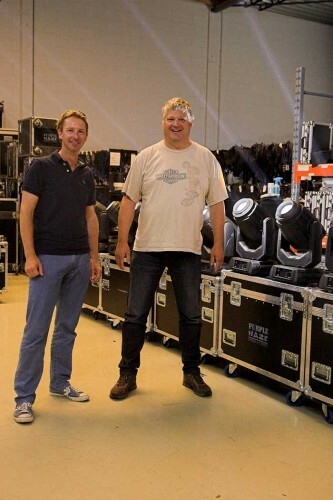 These were in fact the very first Pointes in Holland – delivered after Andre saw them at Prolight+Sound Frankfurt and was extremely impressed. Being a man of action, he put his money straight where his mouth was and placed the order there and then! Andre immediately saw the potential of having Pointes in his hire stock, realising that they would be great both for Purple Haze’s busy work schedule – a mix of their own designs and those of other LDs - but also as a cross-rental item. He likes the beam, the intensity, the effects and the speed of the fixtures. "They do a huge amount more than the current ‘competition’ he remarks with a cheeky grin!" As soon as Purple Haze’s Pointes were delivered, they went straight out on one of the country’s many summer festivals, Baby Pop and then on to a corporate event for well-known aloe vera wellness and beauty product specialist, Forever Living. Since then, they have been constantly working on a wide variety of shows and events. The Purple Haze crew all love the Pointes – particularly because they are so light weight and easy to handle. They were delivered in truck-friendly cases of four units. The MMX Spots were purchased at the end of last year and have also become a massively popular ‘workhorse product’. They decided to buy these units again for their value as a cross-rental item in addition to the creative potential they bring to their own shows. "The high output, optical zoom and the dual animation wheel are all excellent features," says Andre. Speaking about Robe generally he comments: "The brand has a very good name and is growing rapidly at the moment. This is one of the reasons that any investment in Robe is such a ‘good bet’, with the products so in demand and in use every day in The Netherlands." In picture: Jeroen van Aalst from Controllux with Andre van der Heyden of Purple Haze.